Free Delivery! 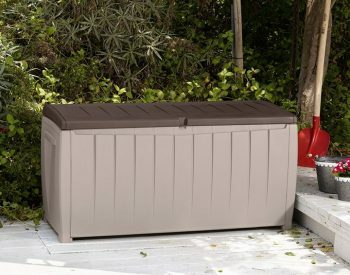 KETER STORE-IT-OUT MIDI is another plastic garden shed unit from Keter, a manufacturer of world-class poly resin plastic outdoor storage solutions. 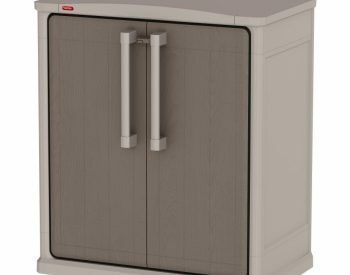 The STORE-IT-OUT MIDI is designed to provide a weather proof outside storage space for poolside, courtyards and other outdoor areas. 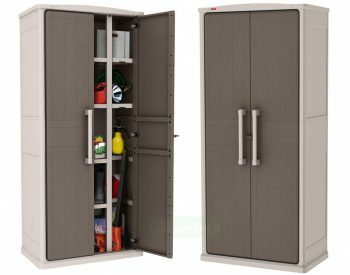 The dark wood-look finish is tough and attractive, and the wide double opening lockable doors and lid offer easy access to this good looking plastic outdoor cabinet ideal for garden storage. The STORE-IT-OUT MIDI is also ideal for storing playground equipment and toys at kindergartens and preschools ensuring that the play areas are kept tidy and safe. 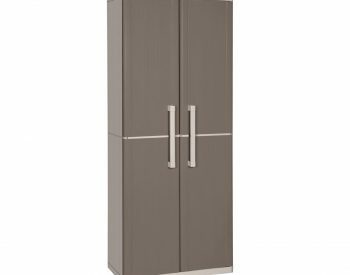 The STORE-IT-OUT MIDI is easy to assemble using common household tools and can be installed on any firm, level surface – no slab is needed as the floor panel is an integral part of the design. 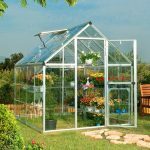 The UV-stabilised poly resin plastic construction is sturdy and very low maintenance, as it will not rust, dent or peel. 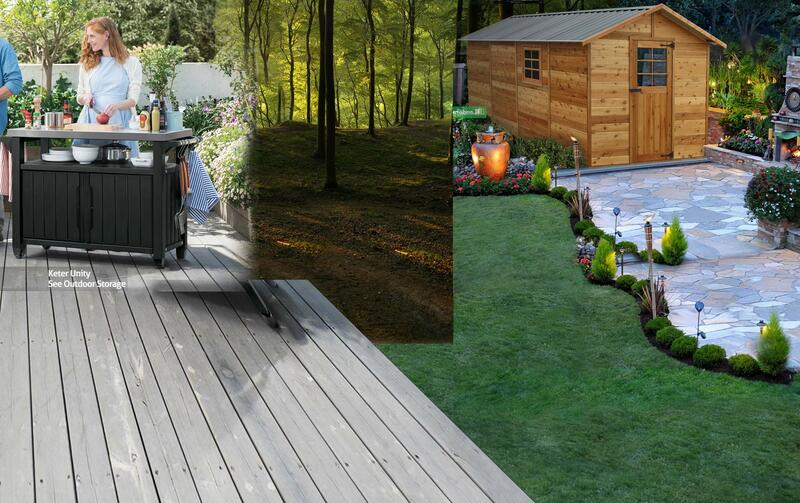 There are good reasons why plastics such as polypropylene resin are used for sheds and outdoor cabinets these days. 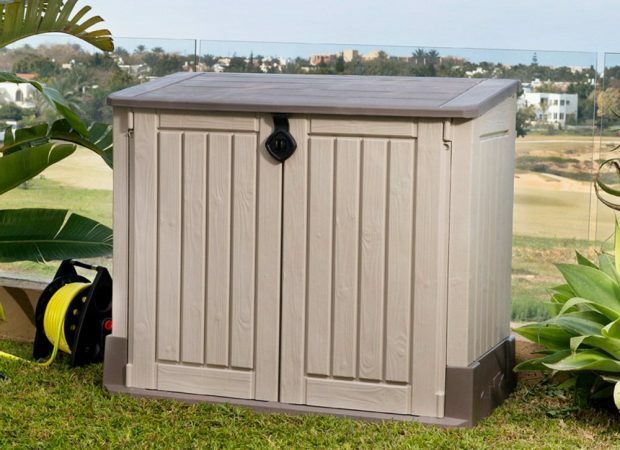 Outdoor storage solutions are becoming more popular – people are realising that it makes sense to use weather proof outside storage units to store pool equipment, garden tools and supplies, sporting gear and toys rather than using up valuable storage space inside. 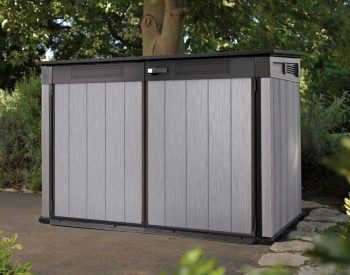 Keter and other manufacturers such as Suncast and Palram specialise in not only plastic outdoor storage boxes and cabinets, but also in a wide range of plastic garden sheds which are ideal for larger items of garden equipment, bikes and sporting eqipment as well as workshop benches and tools. PerfectFantastic product! Easy and quick to assemble. And this box is like the tardis: doesn’t look very big or take up much room but is capable of holding a lot! Electric mower, blower vac, line trimmer, garden hand tools, bucket, cord and more...exactly what I’d hoped it would. Money well spent! 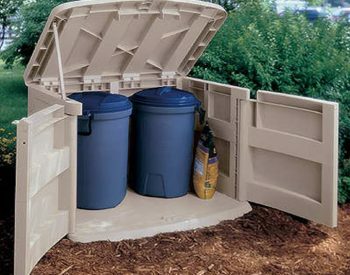 Good little storage unitGood sized storage unit for basic garden supplies. Material is quite flexible so you need a flat area for it to stand or it will twist and not close. Delivery from Landera was quick and easy. KETER STORE-IT-OUT MIDI 1.3m x 0.74mThe delivery was quick and it's easy to assemble. 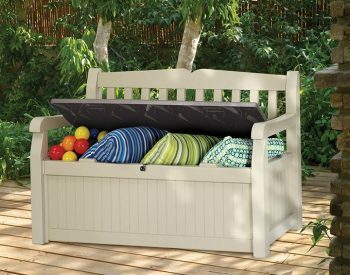 I am using it as a storage for my lawn mover and other garden items. Very happy so far. The only thing - it's a bit smaller inside then I expected - the measurements given are for the bottom floor - side walls designed the way that makes the box smaller. Overall - worth every cent . Quick delivery and easy to assemble.Was surprised with the quick delivery. For it's price it's value for money with a great product. Keter Store-it-out MidiVery easy to assemble and customer service provided was excellent. The item was damaged during shipping, but was provided a replacement (no charge). Upon fully assembling the side panel was immediately damaged by forces of nature, Landera advised us they would replace broken part (no charge). A grade customer service who help you with unlucky issues. Great product and company. Keter Store-it-out MidiThe Keter Store-it-out Midi was delivered quickly and easy to assemble. 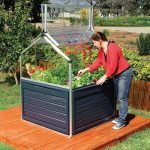 Have been using this unit for a few weeks now and it is great for storing our outdoor garden and mowing equipment. 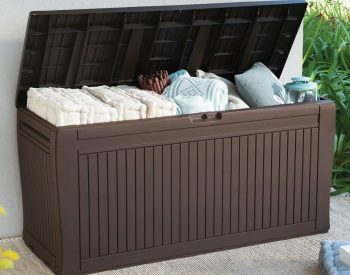 Could have many other storage uses and was competitively priced. This unit was easy to assemble and is great for storing my Dolphin robotic pool cleaner and pool vacuum hose. The Dolphin control storage caddy fits in perfectly! 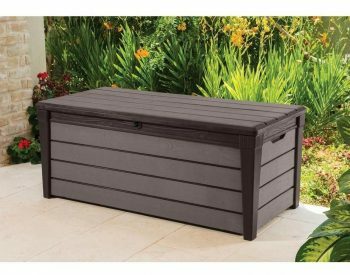 I thoroughly recommend it to anyone wanting to store outdoor items. 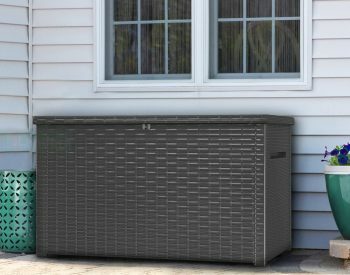 This is a great storage unit for my swimming pool Dolphin robotic cleaner and vacuum hose. Very easy to assemble and looks great. 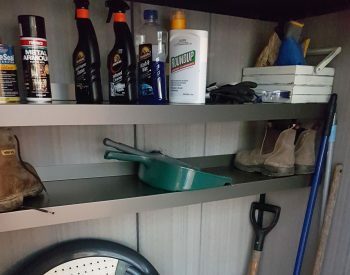 I would recommend it to any one who whants to store stuff outside. Purchased this unit to use as a pool pump/filter housing because of the durable materials, lightweight yet weatherproof and easy to assemble and use. It performs the task very well with simple overhead and front access. 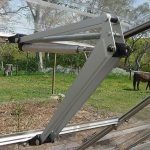 However, be sure that the supplied floor is well supported on solid or compacted level ground to cope with the weight of pool gear, if that is the intended purpose (to avoid flexing when filter is full of water). 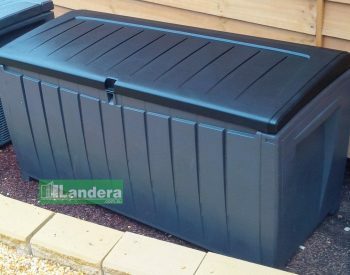 It has drawn lots of positive comments from the pool installers and others and I have referred one to the Landera website. Perfect as a pool pump housing and no doubt great for other storage uses. Delivery time - excellent, all parts were there (I had read reviews of missing parts), only problem I found a brochure where I could have purchased it when I was first looking for $100 less. Don't look back only look forward and it was easy to assemble therefore a great buy.